The Kennet Valley TR Group invite you to Drive it Day 28th April 2019 which is a run and then visit of the Hollycombe Steam in the Country Fair at Iron Hill, Liphook, Hampshire, GU30 7LP. We will be joining Thames Valley TR Group and Windsor Forest TR Group to put on a good display of TR's at the event. The plan is to meet at Wellington Farm Shop, where if you wish, you can have a breakfast, and then leave at 10:00 to take a nice drive through the Hampshire countryside arriving at Hollycombe circa 11:00. Thames Valley TR Group have secured a discounted entrance price of £10 per person which will require a special ticket to be handed out as you arrive. Hollycombe is a registered charity, run by volunteers, so it would be good if you could register for Gift Aid, when you pay, in order to support them. The gates open at 11:00 am. We have a dedicated parking area and feel free to bring a picnic if you wish. There is catering on site, but it maybe limited in options. We are hoping to run a Charity Raffle, more details on the day. Some details about Hollycombe, it takes its name from the Hollycombe Estate which, a century ago, covered 4000 acres, much of which can be seen from the quarry railway. At about this time, the gardens were planted with more than a million trees. In 1951, the estate was purchased by the late John Baldock and his family and it is through them that the collection began. With a love of steam from an early age, with many road engines being scrapped following the end of the Second World War, John Baldock began saving them. his aim had always been to preserve aspects of steam power that was used in this country and maintain an atmosphere of the Edwardian period when steam was a major force in agriculture, transport and industry. The grounds of Hollycombe are historic and it is believed that an Iron Age hill fort once stood near the top of the hill. The Lime & Azalea walks are both part of the historic grade II listed gardens which have been developed over the past two hundred years. The pillars as you arrive on site were originally part of Victoria Station in London and the gates came from Waterloo Station. The oldest example of steam power on site at Hollycombe is the waterwheel and 1840's beam engine. 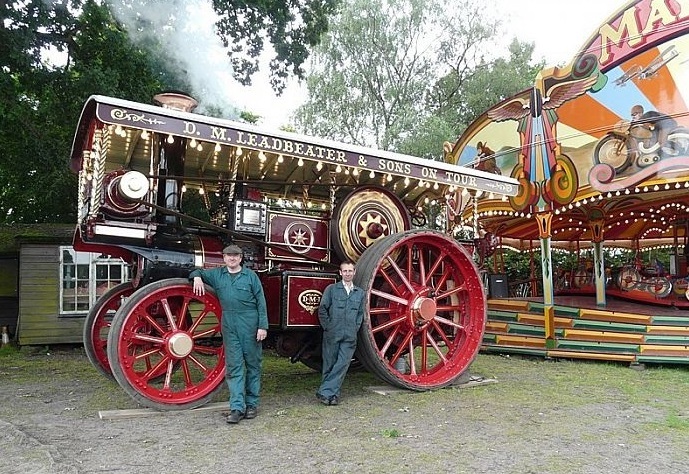 A major attraction at Hollycombe has always been its steam powered Edwardian fair. The fairground takes us back to a more genteel age around 100 years ago to the atmosphere of the larger fairs. Back in the late 19th century and early 20th century the travelling fairs were often villagers first contact with the outside world and often the first to bring electric light and moving pictures to these communities. Indeed the operators of these fairs often achieved cult status and many of the established showmen became famous and a lot of their families continue in the same business today. Hollycombe is fortunate to be home to the world's oldest Showman's engine, Emperor, dating back to 1895. One of the oldest rides to grace fairgrounds were roundabouts which initially started with fixed horses or other animals, known as the 'Dobby Set'. 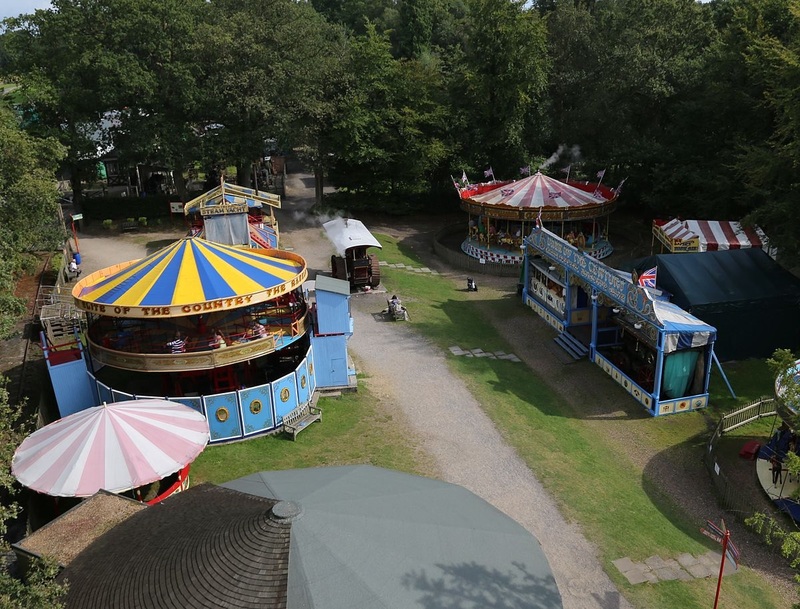 Hollycombe still carries the name Mr Field's Steam Circus, dating from around 1870, making it the world's oldest surviving steam driven fairground ride. For further information either contact by email Phil Horsley KVG Group Leader (07892 715315) for the run or by email :- David Goswell, TV Group Leader or his mobile 07747 700043.